The society started in 1985 when a few avid collectors of local postcards, photographs and books suggested that a local history group be formed. The inaugural meeting was on Monday 14th October 1985 at Dover College Junior School Hall in Shorncliffe Road with the first illustrated talk was given by the late Rev. Alan Gibson on Builders & Architects in Victorian Folkestone in November of the same year. The society puts on a series of interesting local history talks throughout the year which are attended by an average of between 50 and 60 people. Also members are welcome to get involved in research and local history projects and exhibitions. A current project is to create a photographic record of every shop and business in Folkestone and Cheriton. If you are able to help in any way with this, please contact us here. Refreshments are available at these sociable evening meetings and they are a great way to meet other likeminded people. Outings and dinners are also organised for the members. In October 2010 the society celebrated its 25th anniversary with a dinner for members at Folkestone Bowls Club and its 2014 exhibition commemorating the centenary of the First World War attracted over 4000 visitors and national newspaper coverage. Wednesday 1st May 2019 - The History of Folkestone Lifeboat Station - a talk by Alan Taylor 7.30pm for an 8pm start. Refreshments available. We have created a Facebook page and are going to be using it to put a weekly quiz on and also to share old views of the town and put up pictures of unidentified photos to see if anyone can help locate the buildings in them. Please 'Like' our page and share it with your friends. 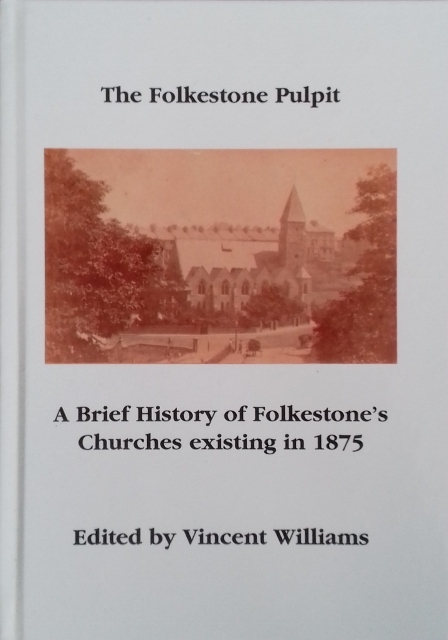 The 'Publications for Sale' page has been updated to include the latest books about Folkestone, including 'The Folkestone Pulpit - A Brief History of Folkestone's Churches in 1875' by Vincent Williams and the 'A E Horton His Life and Autographs' - a reproduction of the autograph book of a local soldier during World War One. Please see the side bar to access our latest ebook - The Autograph Album of Ernie Horton - a local soldier in the First World War who kept an autograph book and English troops and German POW's painted and drew pictures in it for him. Meetings are now held at Holy Trinity Church Hall, Sandgate Road, on the 1st Wednesday of the month (7.30 p.m. for 8.00 p.m. start). Please see the Programme of Events for more details. Although we are not a Society that researches on a commercial basis, our members do have access to resources and if we can help we will. Most answers to questions can be very simple and quick to find. For some questions however, it may take a volunteer some time and effort to locate an answer. We do not charge for conducting research, but if you would like to make a donation to the Society so it can continue to provide this service, please let the person responding to your email know and they can provide you with details to send the donation to. Thank you.